*Are you looking for a nice place to stay in Katapola? * Read about where I have stayed for over twenty years! There are a lot of photos of Amorgos on the Amorgos Friends Facebook page, many of them taken recently. 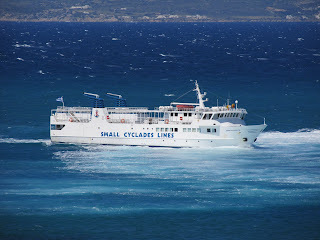 The Express Skopelitis (or Express Scopelitis) is the local ferry serving Naxos and Amorgos and the islands in between. This Danish website gives some technical details about the Express Skopelitis. A book about the Scopelitis family and their boats was published in June 2011. "Scopelitis' Story - The Metro of the Microcyclades" by Giovanni Perotti and Mila de Franco. There is no IBN number. I bought my copy from the Brekas Travel Agency in Katapola; I also saw the book on sale at Zoom in Naxos. For many years the Express Skopelitis typically has had two sorts of route, what we call a "Long Skop" and a "Short Skop"! The "Short Skop" goes from Naxos to Katapola, calling at Iraklia, Schinoussa and Koufonissi. The "Long Skop" goes from Naxos to Katapola, calling at Iraklia, Schinoussa, Koufonissi, Donoussa and Aegiale. Leaves Katapola at 07.00 on Tuesday, Thursday and Friday, arriving in Naxos at 10.50. Leaves Naxos at 14.00 on Tuesday, Thursday and Friday, arriving in Katapola at 17.55. Leaves Katapola at 06.00 on Monday, Wednesday and Saturday, arriving in Naxos at 12.05. The Express Scopelitis in Katapola on 24 March 2014. In Naxos the Express Skopelitis leaves from the small quay in Naxos, not the large quay used by the larger ferries. 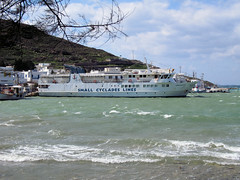 The Express Skopelitis is a very small ferry, and may not run in stormy weather. And may not run in weather that is OK for larger ferries. The Express Skopelitis does not usually run on Sundays. On Sundays in recent summers the Express Skopelitis went from Katapola to Santorini and Ios (see below), and back. In some of the photos below, the Express Skopelitis looks a little rusty. This is because I took the photos in February! The Express Skopelitis usually goes "off duty" for a few weeks in February, March or April for her annual maintenance. She is usually back in service by Greek Easter. Express Skopelitis or Express Scopelitis. The name plate at the rear of the boat reads "Express Scopelitis", a sign inside the boat reads (in Greek) "Skopelitis". I usually travel on the deck of the Express Skopelitis, but the ship has a very pleasant lounge. I did a "Long Skop" on a cold and wet and wintry day, and spent the whole journey in the lounge. It was too wet even to paddle up to the deck, so I peered through the car deck at the islands we called at! You can check her current position on MarineTraffic.com. MarineTraffic.com shows the position of ships worldwide, and is hosted by the Department of Product & Systems Design Engineering - University of the Aegean. The Express Scopelitis at Katapola on 14 October 2012 - a Sunday, and the ferry was at Katapola all day. The Express Scopelitis at Naxos on 15 March 2013. There were Force 9 gusts of wind, and the ferry did not leave for Amorgos at the usual time of 2 p.m.